In early 1896, photographer and publisher Henry A. Strohmeyer (1858-1943) set off for an around the world photographic tour to capture images from Japan, China, and India and various locations in the Middle East and Europe. Arriving in Japan in the Spring of 1896, Strohmeyer probably took around 300-400 negatives which were curated into a set of 72 images, thus establishing the first dedicated box set of Japan views sold in the world. This 72-view set was distributed exclusively by Underwood & Underwood, the largest producers of stereographic cards globally, making – and presumably selling – nearly 30,000 stereocards and 900 stereoviewers per day by 1900. The Underwood & Underwood empire had perfected door-to-door canvassing, employing enterprising college students to directly market their stock to the public. The catalogue and publishing operation of Strohmeyer and business partner Nehemiah Dwight Wyman (1861-1934) was acquired by Underwood & Underwood in 1901, and the 72-view Japan set continued to be published under the Underwood & Underwood imprint until 1904 when it was replaced by the new “Ponting Set.” For eight years between 1896 and 1904, Strohmeyer’s photographs of Japan remained the premier set of Japanese imagery for the American mass public. In 1901, after the acquisition of Strohmeyer and Wyman’s catalogue, Underwood & Underwood re-issued the 72-card set, now listed as both publisher and distributer on the mount. The cards were numbered sequentially and the reverse reprinted the caption in English along with five foreign language translations (French, German, Spanish, Swedish, and Russian) suggesting the international popularity of the series. The series would be re-issued one more time around 1902/3 on slate-colored mounts. Around the end of the first decade of the twentieth century, Underwood & Underwood expanded into news photography, slowing their production of stereoviews through World War I until fully selling off their stock and rights to Keystone Viewing Company in 1921. 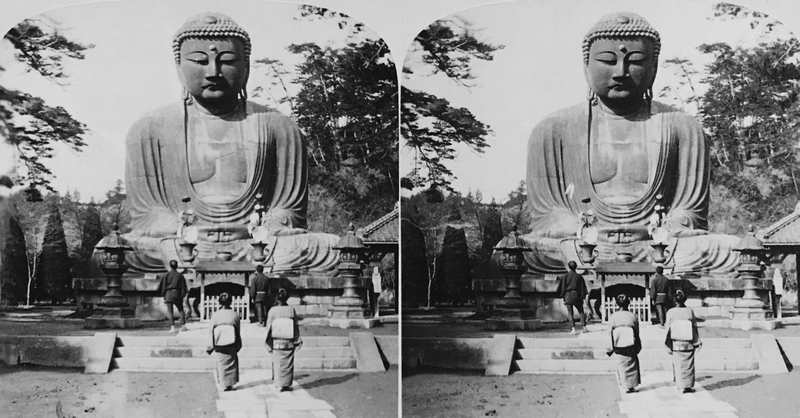 They apparently continued to hold the non-stereographic rights to numerous photographs, however, including Strohmeyer’s 1896 image of the Great Buddha of Kamakura. This above photograph, dated September 11, 1923 on the reverse, was originally owned by the Baltimore Sun and was likely procured in response to the Great Kantō earthquake of September 1, 1923. The Kamakura Daibutsu was easily recognized as one of the most famous monuments of Japan by international audiences and numerous papers reported on the damage of the statue. I have been unable to locate this image among the published papers of the Baltimore Sun, however. It is the left side of Strohmeyer’s original stereoscopic image, photographed more than two decades earlier. For estimates on card production at the turn of the century, see Darrah 1977: 47. Brey also discusses production and the scripted sales pitch that made the Underwoods’ enterprise highly successful, see Brey 1990. For more information on Strohmeyer and the publishers Underwood & Underwood, see Bennett 2006. Most photographers would position their camera on this second landing, an optimal distance to fill a majority of the frame with the Daibutsu. Only a hand of photographers would position themsleves further back, on the first landing, which minimizes the visual significance of the Daibutsu, but also opens the possibility for more visually compelling compositions. Darrah, William C. 1977. The World of Stereographs. Gettysburg, Pennsylvania: W.C. Darrah.